Be sure to check out the launch for Tightrope’s first (but not last) art book! 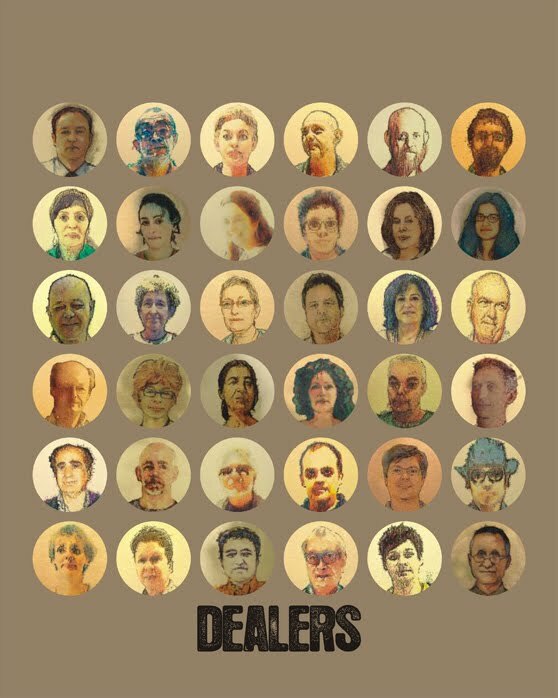 In this remarkable portrait-survey of thirty-six of Toronto’s most distinctive and influential art dealers, artist Viktor Mitic has captured and illuminated the unique individual personalities of his subjects. Depicting by turns their passion, insouciance, vivacity, shrewdness, eccentricity, geniality, and more, these portraits successfully reflect the rainbow of human emotion and expression. VIKTOR MITIC was born in Belgrade, Serbia. A University of Toronto graduate artist, classically trained in art schools in Europe, Mitic has produced a major body of work that spans a career of over two decades. He has recently developed a distinctive, some would say provocative, method; he paints portraits of international iconic images and later shoots the outline of the figures using various weapons and live ammunition. He has had many successful solo and group shows of his paintings in Europe, the United States, Canada, and, most recently, Japan. Viktor Mitic lives in Toronto.